Sturdy welded uprights with both horizontal and miter cut crossbars means you have plenty of support for pallet loads. The universal tear-drop design makes this rack compatible with most other tear-drop rack. Interchangeable tear drop style connectors make these pallet rack step-beams a quick addition to your tear drop style rack system. Beams include special gravity clips to keep beams in place if rack system is jarred or bumped. 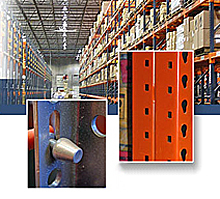 Add wire decking to your pallet rack when you want to store more than pallet loads of goods. This decking has a wire mesh base with cross bars to support and strengthen the decking.